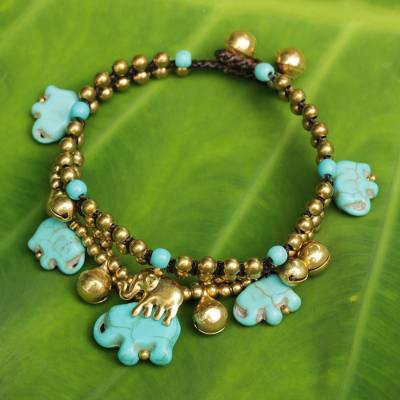 Handcrafted Bead Bracelet with Blue Elephant Charms, "Blue Elephant"
A parade of turquoise-hued elephants distinguishes this "charm"ing bracelet from Thailand's Tiraphan Hasub. The artisan knots shiny brass beads on brown cords, and adds a brass elephant charm to the blue brigade. Ringing brass bells complete the design, and additional bells serve as the bracelet's clasp. Tiraphan hires other artisans at her workshop to help her craft her popular jewelry. Tiraphan Hasub has received 5 microcredit loans with 0% interest from Kiva and Novica, the first for $2850 and the most recent for $2850. Proceeds were used to invest in a bulk purchase of gemstones and other materials for her jewelry making. Tiraphan is deeply committed to ensuring that her children receive the best education. She pays for them to attend a local international school, as she wants them to have the best possible start in life. Tiraphan has thyroid disease. She tires easily and sometimes it is difficult to to find the energy for everything. Yet she refuses to let it compromise her work. Tiraphan has steadily grown her jewelry project and now provides work for other artisans in her community. This artist shows a lot of talent or potential and is in their late teens or twenties. Among the workers at Tiraphan's workshop are some who suffer from polio. Tiraphan supports her two children. This piece is well made and just beautiful! It is a Christmas gift for my daughter. "This is now a cherished heirloom!" "I believe many women think like me, and that's what inspired me to create jewelry that is original." "Sawasdee kha! My name is Tiraphan Hasub, but everyone calls me by my nickname, Yo, which I got from my parents when I was a child. Yo means a kid who cries a lot, and that's exactly what I used to do then. I was very sensitive to everything, and thus cried a lot. "I met my husband at university in Bangkok. I worked there for three years after graduating, and then got married. We moved back to Chiang Mai, where he is originally from, and he taught me the art of handcrafts. We now have a workshop and a daughter. People keep telling me that I am a good mother because I manage to combine motherhood and work, and that makes me happy. "It hasn't always been easy though. It was a great challenge for me to start married life and a different type of work in a place that was foreign to me. It makes me proud to see what I have achieved now. The other challenge I conquered is bungee jumping! "You could say I'm a fashionista, always trying to look good by wearing nice dresses and jewelry. I believe many women think like me, and that's what inspired me to create jewelry that is original. My designs tend to be more traditional Thai than modern, so I'm thankful to Novica for showing my collections to the world." Both pieces I have received are beautifully designed and beaded. Such careful and intricate work. I love the small bells and the choice of beads. I will be checking your site regularly! This bracelet is beautiful, very pleased. Both bracelets are just lovely!